Crowning the relevance of water to this love story, water colour washed brushed strokes and water washed painted applications give visual expression to this motif of life, nourishment and vitality. 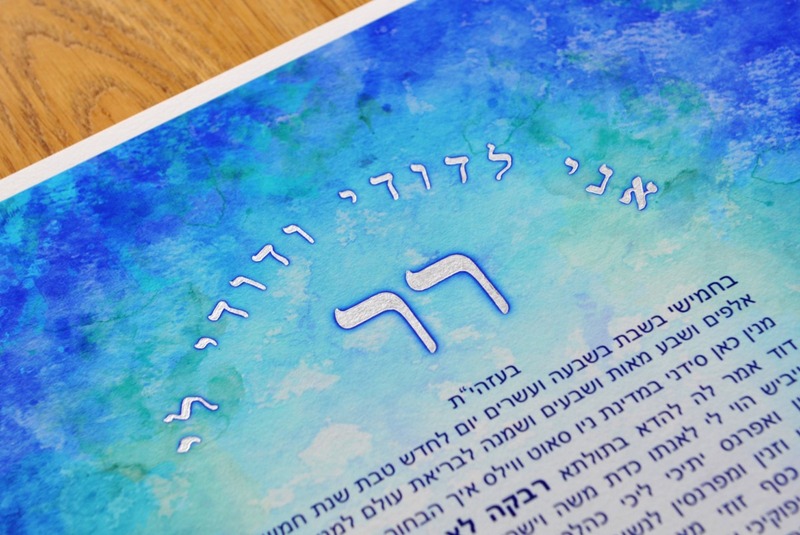 The notion of the wedding taking place in Sydney’s beautiful Darling Harbour is further echoed by the oceanic quality of the Ketubah, and in this way the Ketubah visually and conceptually relates to the setting and scenery of the wedding ceremony itself. 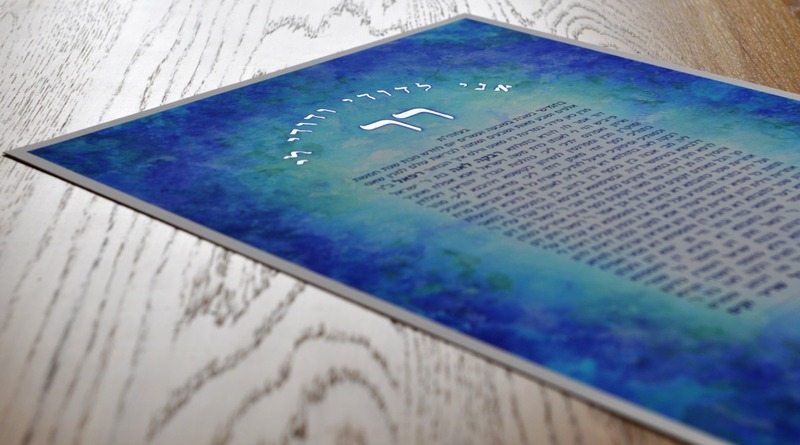 The Ketubah sings of a colour palette of soft navy’s, sky blues, cobalt blues, emerald greens and peppermint. The green here gestures nature. Finding this synthesis between green and blue becomes a metaphor of the harmony of dualities; man and woman, land and sea. 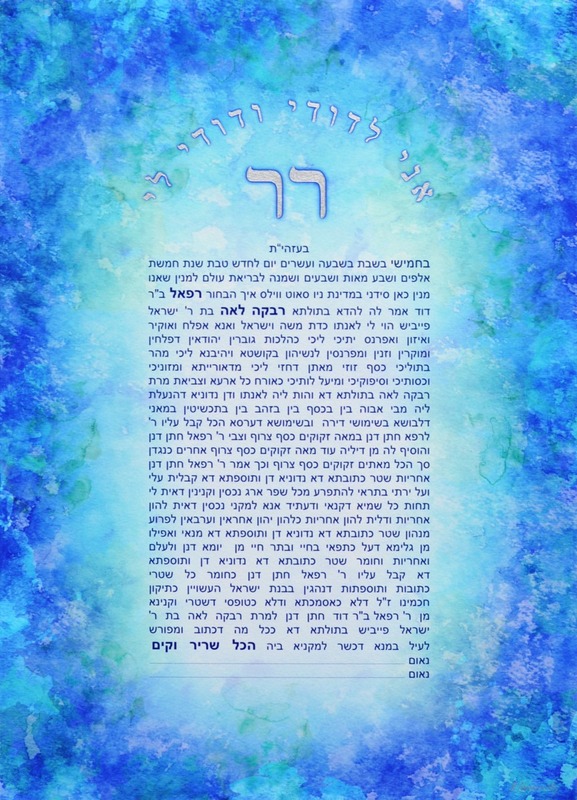 The hymn “אני לדודי ודודי לי – I am my Beloved’s and my Beloved is mine” (Song of Songs – Shir HaShirim 6:3), a romantic declaration written by King Solomon to express the affinity between husband and wife, wraps around the pairing of your initials to create a dome. This creates an enclosure which foreshadows the home that will be built through this union, whilst this psalm evokes the intrinsic commitment, care and responsibility mutually undertaken by husband and wife in their journey through life’s waters. 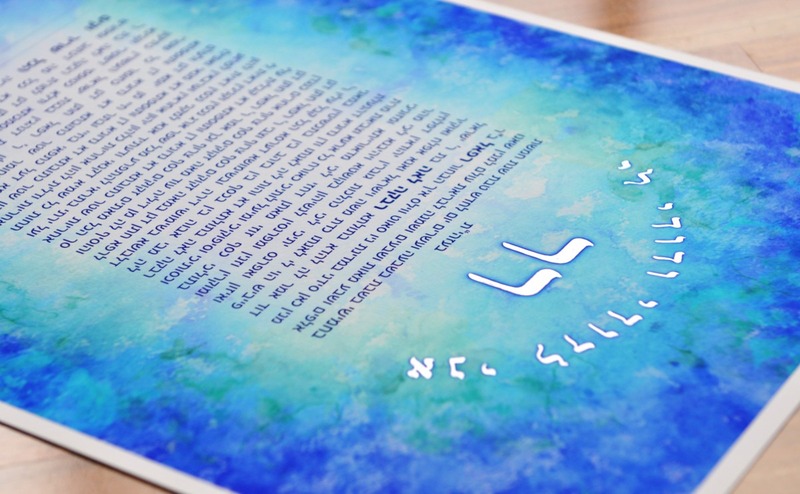 The painting of the couples’ initials and the psalm in a metallic silver gives an iridescent dimension to the work and allows it to softly shimmer analogous to light dancing on the surface of water.